Indie Radio Airplay is one of the best tools available for DIY, unsigned and indie musicians to grow their audience because your music is presented to targeted, supportive fans. Yet most DIY artists struggle to get radio airplay, contacting stations and hearing nothing. Or worse, they hire a radio promoter who takes their money but doesn't deliver any radio spins to show for it. This book reveals the truth behind effective radio promotion, and it's easier that you think. The keys to growing your music through radio have to do with how you reach out to radio and what your ultimate purpose is. Real growth happens when you work to build something more than gaining a spin on a station. This book shows you the step-by-step process that has worked for the best DIY, indie and unsigned artists to gain the attention of music influencers for incredible growth. In his debut book, Smith reveals the exact steps he took to get his radio show which started on a small station in West Texas to being heard across the US on indie and public radio stations, and building relationships with music industry professionals along the way. Learn the process so you can have even better results in getting your music showcased by great music curators to growth farm your audience. This is a sampler of the full book. In this Noisetrade exclusive, read the first 4 chapters of the full book before it's released. The full book goes into more detail on the process of gaining radio airplay, getting your music in front of the right people, building a rock solid contact list and much more. It's available May 3rd. Pre-order now on the Buy Book in the margin. The Audience Growth Farmer, Smith is an award-winning radio personality, speaker, author and coach for individuals, creatives, and small businesses. Focusing on relationship building, his Growth Farming method is pervasive in his writings and media properties. D Grant Smith is the syndicated host & creator of The Appetizer Radio Show, an indie music program showcasing great undiscovered music weekly on stations across the US and internationally since 2003. His work in radio, media, and music extends into areas of marketing and development for artists on an individual basis for audience growth, creating sustainable and supportive tribes of super fans for artists and creative entrepreneurs. Outside of music Smith enjoys reading, craft beer, boxing and all things Batman. He lives in West Texas with two cats. Relationship building is what drives his pursuits in business and in life, which is what fuels his writing, media creation, and production. Andrew Apanov, Dotted Music/We Spin Podcast: “I have to confess. I had been skeptical on how effective radio promotion is for indie artists in 2016. D Grant's book made me seriously rethink that idea. 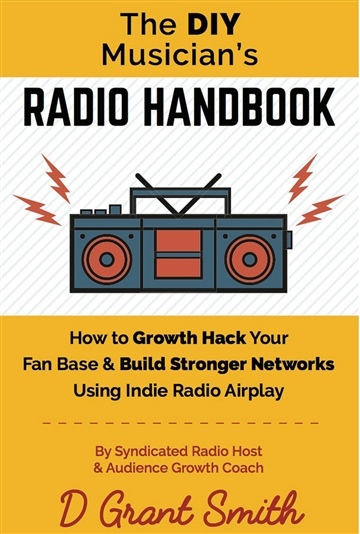 If you don't know how realistic getting airplay is for you, or if you have doubts on the effectiveness of this promotional channel, you have to read this book. Particularly if you're based in the US. It's an essential reading for any music act new to the world of radio promotion. Although someone who has already been pitching their music to stations should find a lot of use in the practical parts of the book, such as tips on researching relevant contacts, or email templates. 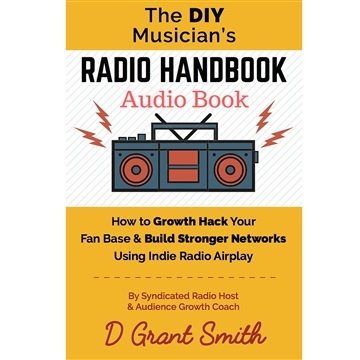 James Moore-Independent Music Promotions Founder & President: "In the DIY Musician's Radio Handbook, D Grant Smith provides without a doubt the most comprehensive and actionable guide for independent musicians who want airplay. Too many artists keep themselves in the dark by constantly trying blanket solutions in vain, such as aiming for major FM radio. He demystifies the process by revealing clear steps and realistic outcomes. And to top it off, the path to success outlined in this book is one D Grant Smith has walked himself on his road to radio syndication. This is a must read for any serious DIY musician." "D Grant Smith is a knowledgeable and insightful ally for DIY artists. Not only does his book provide invaluable guidance in how to achieve radio promotion success, but it does so with an effective message that is easy to understand. In a fast-moving music industry, artists need information that they can quickly synthesize and put into action right away. Smith's book offers that. It walks artists through how to break into radio and, perhaps more importantly, how to make the most of the promotional boost that the medium offers."